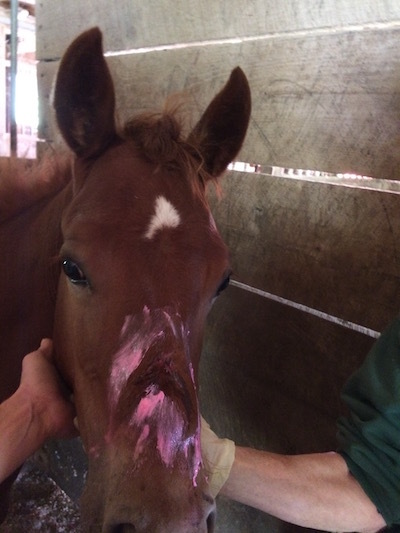 DIY horse care or call the vet? All I can figure out is that she must want a scar that matches Prestos … but bigger. Thankfully I have handy friends and family. 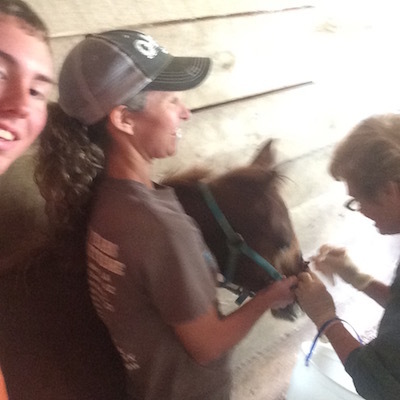 Here is a selfie, shot by my oldest son Caleb, as he holds the fillies hip. Carlye, a retired nurse is cleaning and closing the wound (talented friend) and then there is me. Staring blankly out the door. On purpose. Because the other option is that I pass out. I’m good at holding but waaaaaayyyyyy not good with blood. Or wounds in general. It is a small miracle that I gave birth to three children. I almost didn’t have to lay down flat for routine pregnancy blood draws by child three. Almost. As you can see the wound closed nicely. We (ok,not me) used that special glue from the vet. My mom uses superglue on herself but, you know, its a horse so we buy the extra good stuff! (my son also told me that he glued himself together over the summer. These are the things you learn during ‘family outings’ to the barn). Now here’s my other big contribution. I put lovely pink Swat fly repellent around the wound. Ta-da! Now for the nail biter…will she rub it out as it heals or will she leave it alone? Oh, I should also mention she is up to date on tetanus. Are you as squeamish as me? When do you call the vet vs treating yourself? ← Would it surprise you to know: we received food stamps when getting started? we are really in need for such simple DIY horse care. sometimes we find ourselves in an emergency and we cannot wait until the vet comes. we need to learn to take care of horses all by ourselves. My horse got a nose full of small porcupine quills. It’s a wonder that I succeeded in pulling them out… ever tried this? :) (Hint: it’s not easy). It never even occurred to me to call the vet until my sister mentioned it. And by that time they were already all out. Go figure! Had wounds worse than that heal on their own no issues. You can use Neosporin with pain killer right around the wound like you have the swat and this should help with the itching as it heals. I put it around a bad cut 3 times on one of mine and they never scratched it at all. Worth a shot. Gus cut is leg last week. I took care of it on my own, but Karl said when I called him he would have thought he cut his leg clean off with the panic in my voice! Good news is Gus is a good patient and is doing well. Gus! He needs to stop by for a family reunion sometime. A few weeks ago I think we had all of Maggies foals here…except Gus. Trail ride sometime? I’m lucky enough to have a vet in the family. Which is good because my Appendix Quarter Horse is accident prone. Mostly we can handle it on our own, but sometimes she does a good one and we call Uncle Dean! Looks like a clean injury, but bone is exposed….danger of osteomyelitis/bone infection. Bone infections are very hard to treat when advanced and this a head injury. Must have a vet to examine and treat with antibiotics! Examine bone for injury…. I was thinking the same thing. I would definitely follow up with a phone call to the vet and a round of antibiotics. To be honest unless it is a very basic scratch, I call the vet. I do not like blood, or hanging skin, etc….so I tend to gladly hand my horse over to the vet for stitches and anything else needed. I can handle changing a bandage on a first layer skin wound and applying ointment, but that’s about it! It depends on what day it is, if I’m gonna hit the ground or not because of a wound. Some days I can take it… others… not so much! If I can’t take it, I call the vet. 🙂 If stitches are needed, I call the vet. Otherwise, just treat with honey and herbal stuff. It seemed for awhile, Ghost loved to do this kind of thing to his face. He has a couple of nice scars from it too! Hope yours doesn’t scar too bad. 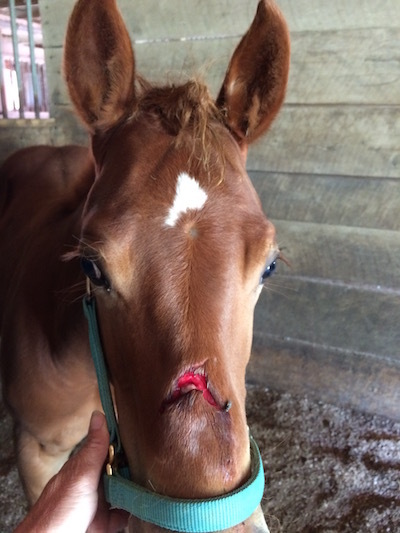 My colt did this when he was being weaned put his head through boards trying to get to mama and pulled back . Did have vet and stitched up healed fine . Still has a little bit of a bump there. Well knowing me I would have called the vet. At least you had someone with experience to help you out. Horses get into trouble in mysterious ways!!! I generally handle most things myself. Blood doesn’t bother me and I can give needles myself if I have to. If it doesn’t seem to be making improvements or needs stitches then it’s the vet! Poor baby! and the foal too. Last December Christmas vacation, my gelding tore his shoulder open on a round pen gate latch that I had left swinging open. Tore his shoulder muscle couple layers deep. It was evening at feeding so it was dark when the vet arrived. Several layers of muscle had to be stitched and then closed the skin. I followed the vets instructions and for a whole month had to clean and flush the wound with Iodine solution. Sand and stones would shoot out. Worried myself crazy …and the vets too with all my phone calls and sending them photos! He oozed and was swollen for days. Of course there were antibiotics and topical salve as well. Was going to attach some photos and warn people about the common round pen latch danger. We sawed them of and use chains to close them now. Best wishes for the little one! It’s a tough call sometimes. When it’s purely for cosmetic purposes, it’s a 50/50 where, does not matter at the end of the healing process, it will heal & nothing else was damaged. I just had this happen with my Shire mare only a week ago. It’s been raining so much here that, she somehow slipped & fell on a folding stand (how, I don’t know. I guess she’s talented that way to find the only 1″ straight edge on an item that was folded & set aside). Less than 30 minutes old, my husband noticed & I was on the phone to the vet, sending a photo to see if it was worth stitching up. Answer: It’s up to me. Perfect candidate for stitching up, will heal quicker & nicer but may lose the skin flap regardless. Costly. Or leave alone & treat with Manuka honey. Will lose the skin flap, will have uneven scar tissue. Cost of honey. My horses are notorious for finding ways to injure themselves, especially my baby horses. The vet has literally given us everything needed to doctor the injuries because we live so far from town, she finds it saves her time and us money (we appreciate that). Also my mom is amazing at doctoring animals, which I am grateful for as I too don’t like dealing with injuries and blood. I always worry I’ll make it worse (it’s a wonder I actually wanted to be a vet for the first 16 years of my life. Hahaha). In the end, I only call the vet when the issue is not obvious, like a horse going off it’s feed or when it’s worse than anything I’ve previously delt with.